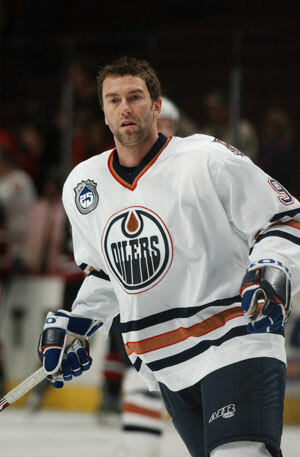 The Edmonton Oilers have claimed centre Petr Nedved off waivers from the Philadelpia Flyers. To make room on the roster for Nedved, the Oilers have assigned left winger Patrick Thoresen to the Wilkes-Barre/Scranton Penguins of the American Hockey League. Nedved has split the 2006-07 season between the Philadelphia Flyers and their AHL affiliate, the Philadelphia Phantoms. The 63", 196 pound native of Liberec, Czech Republic scored 1-6-7 with 18 penalty minutes in 21 games with the Flyers this season and had 4-7-11 with 10 penalty minutes in 14 AHL games with the Phantoms. A veteran of 963 NHL games since breaking into the NHL with Vancouver in 1990-91, Nedved has scored 309 goals and 403 assists for 712 career regular season points and has 698 penalty minutes. Now in his 15th NHL season, the 35-year-old forward has 79 career powerplay goals, 13 shorthanded goals and 39 game winning goals. This will be Nedveds second tour of duty with the Oilers. He first came to the Oilers, along with Jussi Markkanen, in a trade on March 3, 2004. He scored 5-10-15 with 4 PIM in 16 games for the Oilers during their playoff stretch drive that season. Nedved will wear sweater 93 with the Oilers. Thoresen has scored 2-7-9 with 33 penalty minutes in 32 games for the Oilers during his rookie season. He is ranked among the NHL rookie leaders in scoring (17th), assists (12th) and game winning goals (8th with 1).